I tried to go for a minimalist layout in May because we are moving this month. With fewer spreads and less decorative detail, I thought I was doing myself a favor. But, I found the reason why I need to have decoration and details in my bullet journal. Now, each person has their own idea of what minimal is. My May setup is probably still considered artsy to some people. For me though, it was very minimal. I drew out all my pages in less than an hour. 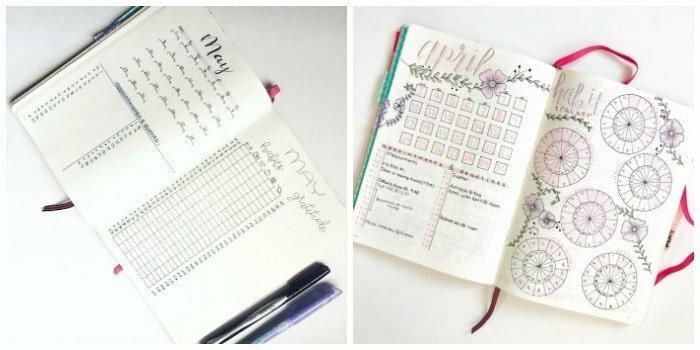 This month, I’ve also done away with a few pages that I used in March and April. I don’t have a monthly meal plan page because at the end of April, I completely ignored mine and it was useless. At some point, I would love to add it back in. But with moving this month, I just couldn’t justify adding a page that might get overlooked more often than not. 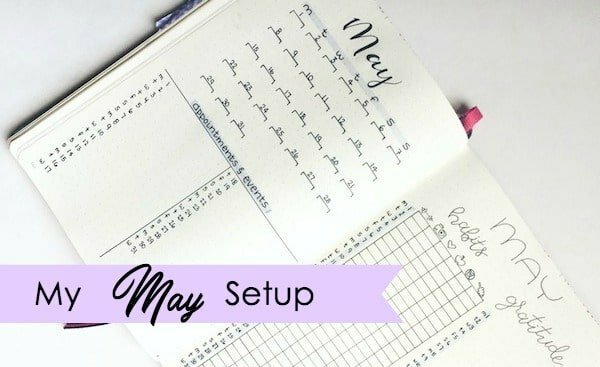 So, my monthly layout for May includes my month at a glance in a mini calendar and list format, my habit tracker, gratitude log, mood tracker, and a goals page. Last month I used eleven pages, and I found it difficult to keep up. Just like a lot of people, I’m still learning what works for me and what doesn’t. For the time being, I think having less monthly pages is more doable. However, I just can’t quite do minimal. As you’ll see below, I ended up adding some decorative banners to my monthly page, and I decided to get more creative with my weekly and daily spreads. And I’m about to tell you why. So, I’ve mentioned before that I’ve never been able to keep a planner. And the reason is, they’re boring. I’m motivated to write in one for about a week or two, and then I give up. 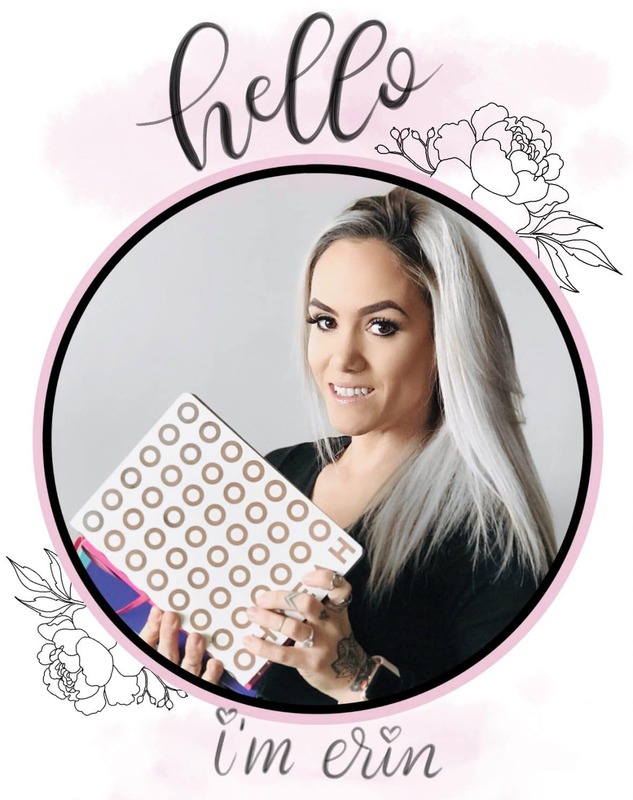 The ability to be creative and have fun with my bullet journal is what keeps me motivated. Yes, the productivity aspect is key. 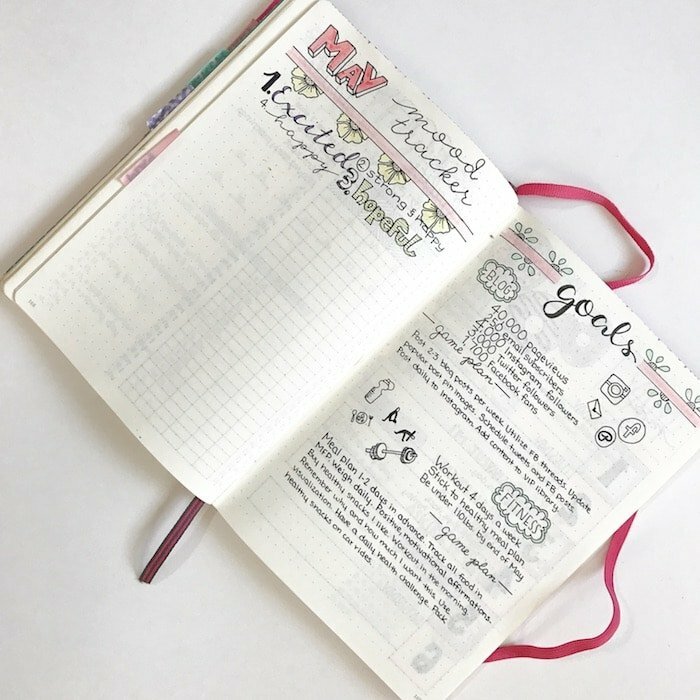 But, I don’t think I would use my journal to its full potential and be accountable for writing in it each day if I stuck to a very minimal layout.
. I did decide to stick with the small calendar and dated list below for my month at a glance. 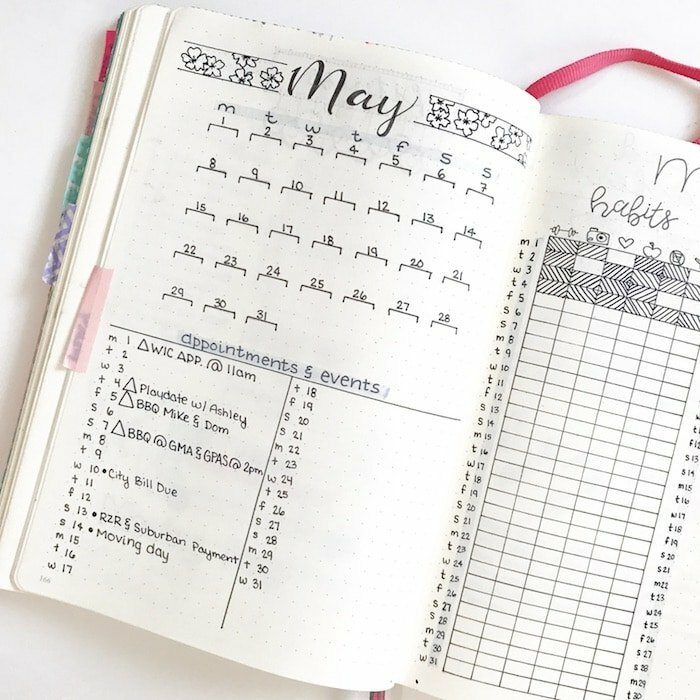 This is my favorite layout so far because it allows me to see the whole month in calendar format, and still gives me room to write in events and tasks. I have a feeling I will stick with this monthly spread for many more months to come, but who knows? I’m pretty spontaneous and can change my mind on a whim. Notice the floral banner? And that’s when the minimalism went out the window. 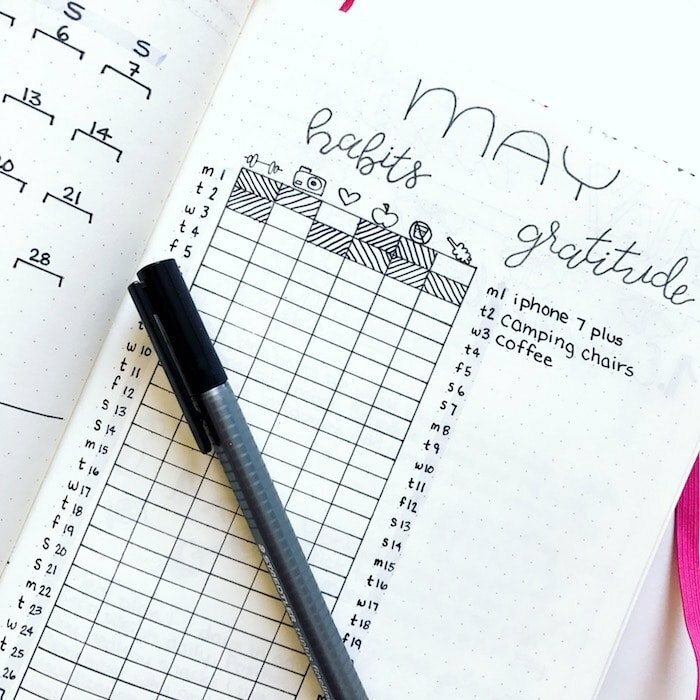 On the adjacent page, I have both my habit tracker and my gratitude log. My habit tracker is much more simplistic than last month’s mini trackers, and I’m loving the vertical layout with the icons. The idea comes from Cristina from My Life in a Bullet. My gratitude log only is only half a page width, making it perfect for a short, one-word entry. Last month I had enough room for 2-3 sentences, and it got overwhelming and I felt like I was never writing enough. So, this month I’ll try the one-word technique and see if it’s any better. The following two pages are my mood tracker and goals page. 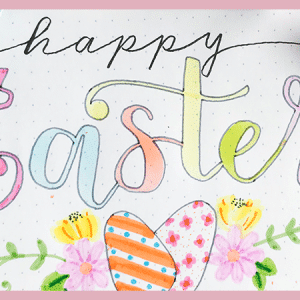 Instead of drawing out shapes or a mood mandala, I just added a simple header and left the rest of the page blank. The idea is to add one or two words each day based on how I was feeling. One thing I like most with this is that it isn’t restricting. Last month I had quite a few different categories for moods, but there were days that I felt my mood didn’t really fit into any of them. Being able to write out a word feels much more honest and applicable to me. 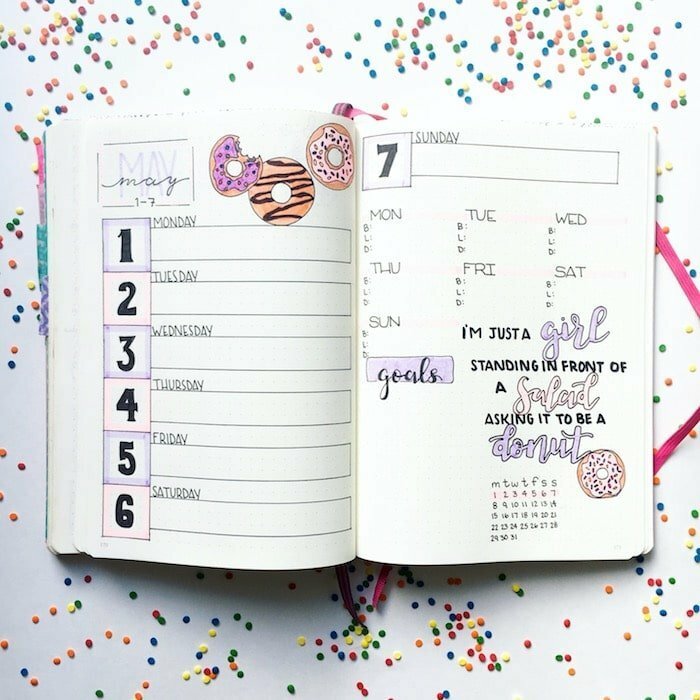 My goals page is an absolute must! 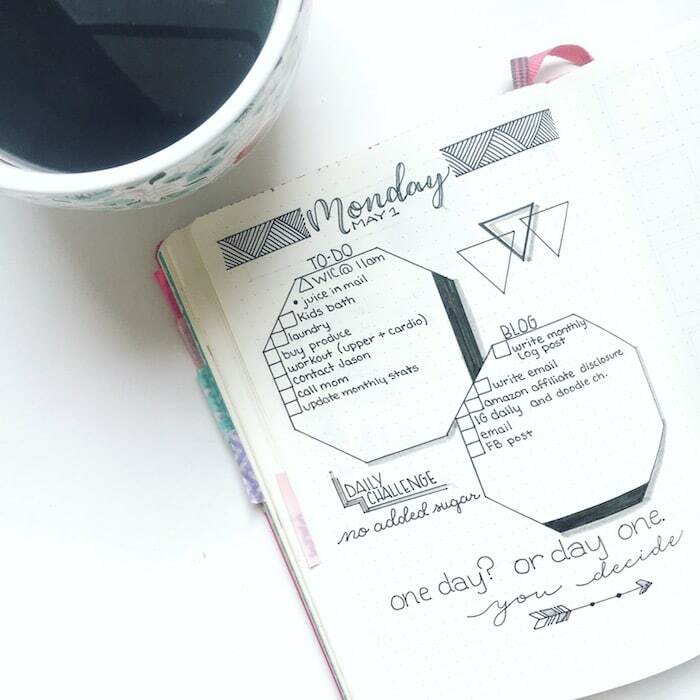 I love to have small goals to focus on throughout the month and even the week. Also, I do add a bit more detail and actual writing to this page because from my experience, it’s necessary to have goals and a well thought out action plan. 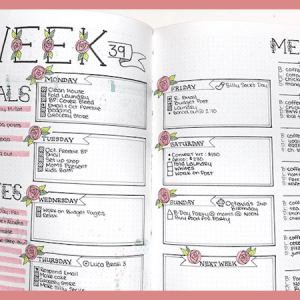 If you’ve been keeping up with my Bullet Journal 2.0 Blog Series, you may know that this coming week I’ll be talking about weeklies vs. dailies. April was the first time I’ve used dailies, so I’m no expert. But, I think I’ve found a method that works for me. I always have a weekly spread, because I love them. It’s reassuring to be able to see all my big events and tasks in one place. And I highly recommend that everyone have a weekly spread for this reason. But, I did start using dailies because there were days where all my tasks overcrowded the boxes on my weekly spread and I needed more room. Again this month, I’m using both. For the first week, I used both. 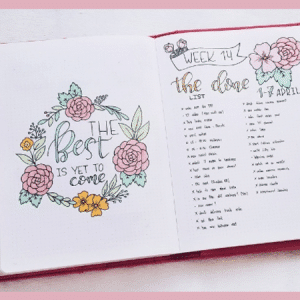 My weekly spread didn’t have much room for tasks and events on each day, but because of the daily logs, I didn’t need much. The second week, I’m only using a weekly spread because we are moving and I know I won’t have time to create daily spreads and use them effectively each day. So, I adjusted the size of my boxes in the second week to accommodate more tasks and events, like a hybrid of a weekly and dailies.